Feb. 16-24—RUTLAND—Rutland Winter Fest returns this year, featuring a week-and-a-half of activities to get the community involved in indoor and outdoor fun in the snow, and out of the winter blues. Events will span nearly every day, Feb. 16-24. The fun kicks off Friday, Feb. 16 with a free community skate night from 6:30-8:30 p.m. at Giorgetti Arena, 2 Oak St. Extension, Rutland. It will be an evening of skating and activities including free rentals, snacks, and a hot cocoa bar. Saturday, Feb. 17 sees a day in Rutland’s Main Street Park for the Snow Sculpture Contest and a Chili Cookoff. From 10 a.m.-2 p.m., teams will be carving 4-feet by 8-feet blocks of snow/ice, developing their masterpieces. Spectators are encouraged to come watch. At the end of the day, the teams competing will be judged and the winning group will be announced at 2:30 p.m. For those not competing, Wonderfeet Children’s Museum will be on hand helping kids of all ages to decorate and create snow creatures; or toast marshmallows with the folks from the Boys and Girls Club. Don’t forget the skating rink will be back for broomball or ice skating (make sure to bring skates and a helmet). From 12-3 p.m., the Chili Cookoff will be taking place, when professionals, organizations, and amateurs will be vying for cash prizes for best chili. Tasting is free to the public, to warm everyone up! On Sunday Feb. 18, the fun moves back to Giorgetti Arena for Go Play Day and the Teddy Bear Carry, from 10 a.m.-2 p.m. 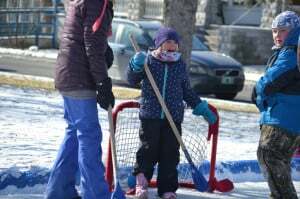 The day is totally free, and features snowshoeing and hiking in Pine Hill Park; ice skating; fat bike demos; food and drinks; marshmallow roasting by the fire pit; sledding (bring your own sled); raffles, and the Teddy Bear Carry competition. Monday, Feb. 19, Rutland Country Club is home to the Frosty Feet 5k Run/Walk for Autism Awareness. Registration begins at 10:15 a.m.; the race begins at 11 a.m. The course is a loop, allowing for 2.5k or 5k racing. Proper footwear is encouraged, as the course is not plowed or paved. All ages are welcome. The cost is $5 pre-race day, or $10 on the day of. 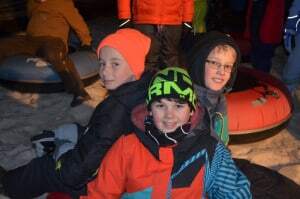 Tuesday evening brings the fun to Center Street for night sledding from 7-9 p.m. Center Street is closed to traffic and turned into a sledding hill, complete with music and hot cocoa. It’s a free event. Wednesday sees no activities, the but the fun returns on Thursday, Feb. 22 for the Winter Olympics at Vermont Sport & Fitness, from 12-4 p.m., for indoor games including pickleball, mini tennis, curling, bowling, figure skating, and big ball hockey. Outdoor games include a snowshoe race and sledding challenges. All events are free. Rutland Regional Medical Center is home to winter fun from 4-8 p.m. with indoor and outdoor family-friendly activities: a teddy bear clinic, cookie decorating, puppet shows, photo booths, arts and crafts, a DJ dance party, hayrides, snow sculptures, games and prizes, giveaways, pizza and hot chocolate. Once again, all events are free. The event ends Saturday, Feb. 24, with a Center Street Story Walk from 10 a.m.-3 p.m., when participating businesses will be a part of a scavenger hunt around the book “The Mitten.” Read the pages of “The Mitten” through the windows of 14 total locations and complete the walk at Wonderfeet Kids’ Museum, where kids receive a free book if they complete the scavenger hunt. See participating locations at rutlandrec.com. Later that evening, the Real Rutland Feud will be presented at Paramount Theatre at 7 p.m., based on the TV show, “Family Feud.” Audience participation will be a part of the evening, with “Minute to Win It.” Tickets are $20. For more information or tickets to any of the events, visit rutlandrec.com. Kids at a previous Winter Fest enjoyed activities like pond hockey, night sledding, and snow sculpture decorating. The same activities — and many more —return this year .